One Stop Tourism L.L.C Kollam Kernels clinched the Kerala Premier League season three title after defeating Seven Seas Trivandrum Royals by three wickets in a thrilling final at the ICC Academy Ground on Friday night. Umar Ali Khan turned out to be Kollam’s star by smashing a spectacular half century which helped his team achieve the target of 189 in 19.1 overs. Trivandrum, which batted first after winning the toss, reached a good total of 188 for the loss of six wickets in 20 overs, thanks to a 19-ball 50 from Waheed Ahmed, who smashed one four and five sixes to entertain the weekend crowd. Openers Waseem Rana and Sangeeth Joseph gave a 68-run opening stand to Trivandrum. Rana played an aggressive knock and smashed five boundaries and two sixes in his 18-ball 38, while Joseph gave good support by chipping in with 22 from 19 balls with the help of two hits to the fence. Though Ibrahim (nine) fell cheaply, Hasnain Raza (23) and Jeevan (22) contributed some useful runs before Ahmed blasted his half century and helped Trivandrum reach a good total in the final. Ahmed remained not out while Touqier was unbeaten on three. Asif Mumtaz picked up two wickets for 35 runs from his four overs, while Rohan Mustafa, Vishnu and Atta bagged one wicket each. While chasing Kollam openers Waqas Ahmed and Adi Mirza gave a 32-run opening partnership. Ahmed left after making a nine-ball 19 with the help of four boundaries, while Mirza hit one four and one six in his six-ball 11. Shabir was dismissed by Touqier for four, but Mustafa kept one end safe by adding a 34-ball 41 with the help of five boundaries. He and Umair Ali added some useful runs with the latter smashing some superb shots all around the park. Even after the fall of Mustafa and Umair Ali, Pervaiz Nazir steadied the innings with an unbeaten knock of 25 from 16 balls with the help of one four and one six. Asif Mumtaz also played a delightful knock of 16 from seven deliveries with four hits to the fence. Azhar was unbeaten on three and helped Nasir take Kollam home with five balls to spare. Touqier and Shafaqat Ali bagged two wickets each, while Fazal and Waheed Ahmed picked up one apiece. Umar Ali was adjudged man of the match for his spectacular batting in the final. 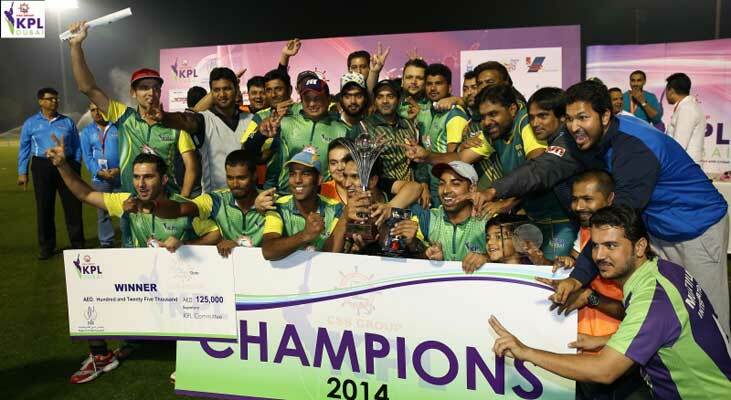 KPL, which offers a total prize money of Dh250,000, was held under the collaboration of Dubai Cricket Council. The tournament was sponsored by the CSS Group.